Note: the road to the col du Coq from St. Pierre de Chartreuse was blocked in late 2017, and there is as yet no news available about its reopening. See here for further details. That spurt out everywhere with a chuckle..."
For the purpose of this guide, the Dent de Crolles area is deemed to include the long, narrow, upland area stretching from the col du Coq, at the southern end, to the col de Bellefont (also known as col de Bellefond) in the north - a distance of some five or six kilometres (map). A line of cliffs divide it into two discrete sections, with the plateau of the Dent de Crolles in the south, and the Chaos de Bellefont in the north. The only practical ways through these cliffs is by means of the Cheminée du Paradis, a chimney situated at the eastern end, close to the steep escarpment overlooking the Isère valley, and a rake which rises through them at the western end. 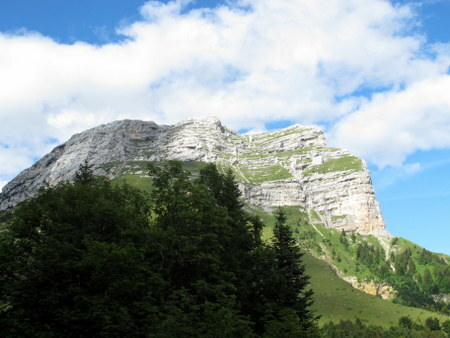 The Dent de Crolles has more routes on it than any other part of the Chartreuse. This, no doubt, is partly due to its ease of access, and partly due to the fact that its summit totally dominates the Isère valley below. However, the main reason must simply be that it offers magnificent walking. The easiest approach is from the col du Coq, one of the high road passes between Chartreuse and the Isère valley. This climbs to within 600 metres of height, and 1,500 metres in distance of the summit, and has convenient parking at the top. To the west, Perquelin offers a variety of routes to the plateau, allowing a number of circuits to be constructed. All routes from here involve over a 1,000 metres of ascent. To the east, a route ascends from the Commune de St. Hilaire, which is perched on a narrow plateau perched half way up between the escarpment above, and the Isère below. The Dent de Crolles is not only a magnet for walkers, it is also a place of pilgrimage for cavers. The main cave, the Réseau de la Dent de Crolles has over 60 kilometres of passages contained within an area of under 2 km², has 11 entrances, and is 695 metres deep. It is possible to descend from almost the top of the mountain, all the way to the source of the Guiers Mort almost 700 metres below, and it is possible to traverse right through the mountain, from one side to the other. Whilst such expeditions are for experienced cavers only, you should take the opportunity to have a look into the entrances of some of the more accessible caves. It's always worth carrying a couple of light-weight headlamps. You can get a flavour of the underground world from this photograph album.